The alleged murder of 8-year-old Bradyn Dillon in February 2016 was not mentioned during the announcement at Gungahlin yesterday that the ACT Government will in its upcoming Budget allocate $10 million to fund 20 additional child and youth protection services case workers over four years and almost $34 million for its out of home care program, but surely these initiatives are in part a reaction to the Jacka boy’s tragic death. In announcing the funding boost to the Community Services Directorate and the A Step Up for our Kids program, ACT Minister for Disability, Children and Youth Rachel Stephen-Smith acknowledged that the volume of reports of concerns around potential family violence and child safety in the ACT had remained at a high level over the past year. 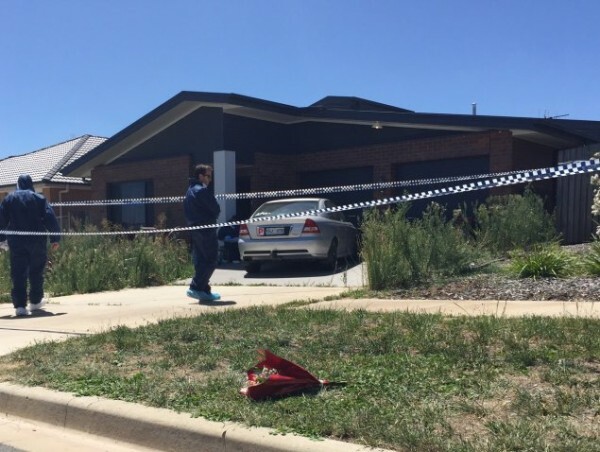 No one asked her whether the death of Bradyn Dillon had been a catalyst for this sustained high level of reporting, but there is no doubt that Canberrans were shocked into paying more attention to the welfare of children in their communities following the boy’s alleged murder. Bradyn’s father, Graham, was charged with murder in February 2016. He has pleaded not guilty to all charges. Within days of Bradyn Dillon’s death, the ACT Government launched a major review of its responses to family violence, known as the Glanfield Inquiry. The review set out examine the interactions between ACT Government directorates, agencies and service providers to help identify areas where they could improve support for families experiencing violence. Following the release of the Glenfield Inquiry’s findings, the Government made family violence the major focus of last year’s Territory Budget, introducing a safer families levy of $30 per ratepayer, which contributed $19.1 million of a $21.42 million Safer Families suite of family violence prevention initiatives. At the time, some commentators felt the focus on family violence was over the top, but Ms Stephen-Smith believes investments in children’s welfare are making a difference. Will $44 million be enough? Here at the RiotACT, we applaud the ACT Government’s commitment to boosting staff and resourcing in the Community Services Directorate’s Child and Youth Protection Service by $10.1 million over four years for two additional casework teams. We recognise that staff turnover in such casework teams is higher than in other sectors due to the extremely stressful and intensive nature of the work, and we acknowledge the tireless work that these people do in our community in trying circumstances. We applaud the increased funding for the A Step Up for Our Kids program, too, with its focus on early intervention to prevent children from entering care, or if that child or young person does enter care and cannot be returned to their birth family, on achieving stability and security in a safe and loving home. But funding can only achieve so much, and this is where you come in, Canberra. The Budget allocation announced this week comes at a time when demand for foster carers is soaring. ACT Together, a consortium led by Barnardo’s and created to provide quality services for children and young people in out-of-home care in the ACT, is urgently seeking 80 new foster or kinship carers (the latter are carers who are related to the children). 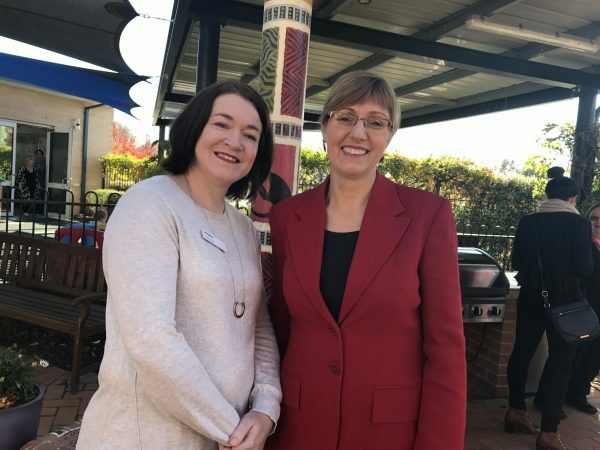 The organisation’s general manager, Melissa Bell (pictured above with Ms Stephen-Smith), was at the pre-Budget announcement yesterday and said she and her team planned to work hard to find these carers by the end of this year. In recent weeks, I have met with two women whose lives have been transformed through their decision to welcome foster children into their homes. In both cases, the women had a partner, but no children of their own prior to become foster carers. All four of these foster parents clearly had a huge amount of love to give and a passion for sharing the wonderful elements that make for a contented and stimulating childhood. In both of these families, the foster children had spent their early years with birth parents who were simply not able to provide an appropriate level of care for them – though in both cases the children still have contact with their birth families. Each of the children had a set of issues that needed addressing related to their upbringing to that point, and in each case, huge strides have been made. It hasn’t been easy, but clearly the rewards have been great. I can’t remember more uplifting conversations than those in which these foster carers talked proudly of the achievements of their children as they shared photographs of them playing with their schoolmates, engrossed in books in the local bookstore, dressing up for fancy dress parties, enjoying family holidays and generally living the sort of life we hope and expect that all Australian children should be able to enjoy. Is it hard work at times for these foster parents? Of course it is, but neither of these women would change a thing. In fact, both families are going down the adoption path, which will provide the children involved with the stability they need to feel secure as they learn and grow. If you think you might be in a position to provide a loving and stimulating home for a child or children, now is the time to contact ACT Together and help them bring that number down from 80 to 0. Because if ACT Together needs 80 carers, that means there are dozens of children in our city who need someone to care for them right now. For more information on fostering a child or children in Canberra, visit the ACT Together website, call 1300 WEFOSTER (1300 933 678) or attend an information session at 26 Thynne St (also know as 6a Traeger Court), Bruce. The next session is from 1pm till 2pm on Wednesday, May 31, but there are two sessions each month (see the full schedule for the year here). Unfortunately, Ms Stephens-Smith failed to mention that just a week prior to this announcement, Bradyn Dillon WAS mentioned in the ACT Legislative assembly. On the 10th of May it was made clear to Ms Stephen-Smith (after she had read a statement that proved she knew nothing about her CYPS department) by Greens and 2 previous Shadow Ministers that an external review mechanism and accountability for CYPS decisions were an absolute priority for Canberra children. This followed a motion that Mrs Kikkert tabled in the assembly for oversight (that Ms Stephen-Smith rewrote with the outcome being effectively the same). Several matters were brought to the attention of Ms Stephen-Smith during the debate including the fact that year after year and review after review had called for such a mechanism and the Government continually fought against such oversight and swept the issue of departmental misconduct under the rug. ACT Greens pointed out the discrimination within the department, Mrs Lawder point out that the department breaks the law on numerous occasions and Mrs Burch pointed out that departmental staff lie about families and bully those who stand up for change. Jakob’s Voice made this debate a subject of a video (https://www.youtube.com/watch?v=IvGDqC0jiXU) due to the decisions that caused his death 3 days after Bradyn’s death in February 2016. No amount of new staff will assist until there is accountability for their decisions and proper training of current and new staff. Ms Stephen-Smith has until August to respond fully to her own motion that was originally tabled by Mrs Kikkert.